Sonically, Petty brings the band of Mike Campbell, Scott Thurston, Benmont Tench, Ron Blair and Steve Ferrone into the world of Chicago-styled blues. 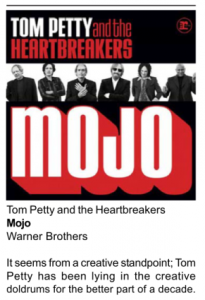 This may make Mojo sound great, but it's mind-boggling how Petty has failed to come up with any kind of hooks or melodies to really make a sharp and swaggering record like he had done for decades. Lyrically, he meanders all over the place from the opening "Jefferson Jericho Blues," where he brings up Thomas Jefferson and the black maids he slept with before going into metaphors of jilted lovers and getting old. Rambling and mumbling through the songs neuters the fresh bluesy feel of the record. Sure, the band sounds vibrant with Campbell's great guitar work, Ferrone and Blair's solid rhythm section; but Petty sounds like he could care less about playing or being there. Bringing the band into the blues doesn't have the result he looks like was going after. His heart does not seem into it this time around. At least on The Last DJ he had conviction, even if it was misguided and self-righteous. Highway Companion might have found Petty sounding sad and defeated, dealing with older age; but there was an earnest to his playing. Mojo is a 65-minute bore that doesn't even sound good if you were stoned off your rocker. Petty can't use that excuse anymore. He once had the kind of swagger to make Mick Jagger blush. Now, he just sounds old without a care.